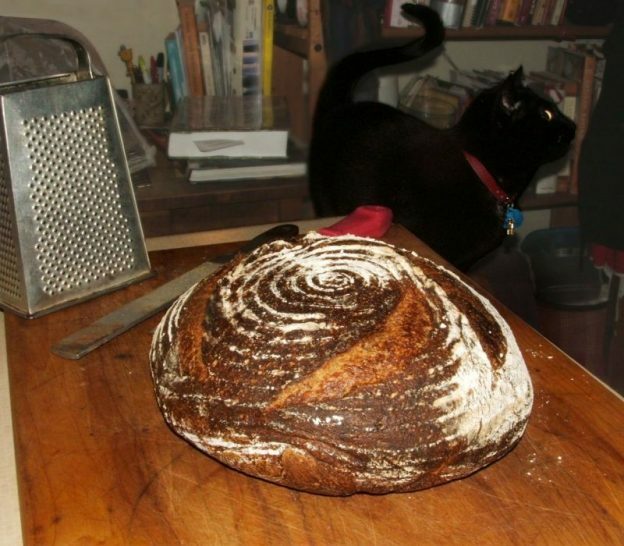 When we first started baking bread in our combo cooker and began to REALLY go for that dark as mahogany, “bien cuit” look, this kind of problem with a burnt bottom was happening relatively frequently. Sure, the bread looked fabulous on top. But it was black as the ace of spades on the bottom. Who knew a box grater would come in so handily? And a file and rasp from the tool box…. Of course we waited until the bread had cooled completely before beginning the labour. It wasn’t easy and both of us took turns rasping/grating away. It turns out that the tiny box grater isn’t much help. Still, for that tiny bit of fine work on the very edge, it did the trick. The furry black fiend sat on the stool by the telephone table and watched as we laboured away, but jumped down after the filing stopped. We were a little sorry that we weren’t smart enough to keep the burnt crumbs to use in gravy. I bet they would have added a lovely dark flavour. But what do you bet our garden compost next year will be better than ever? If we hadn’t been well aware of how much time and effort we had spent removing the burnt bottom from the bread, we would never have known it was burnt. The bread was delicious! This isn’t the first time (by any means) that we have used this trick. In fact, we grated the burnt bottom off the bread we brought for our feasting on Cousins’ Day last September. This entry was posted in baking, bread - yeasted & unyeasted, equipment and techniques, food & drink, sourdough and wild yeast, whine on Saturday, 25 August 2018 by ejm. Brilliant. I usually move my bread to a baking sheet when I remove the lid from the combo cooker. I take the whole thing out of the oven and move the loaf to the baking sheet and put it back in the oven. It’s super easy with oven mitts or the parchment. Just remove the bread from the oven, move it with oven mitts or, if you’ve left the parchment under the bread, use the parchment. Then place the whole thing back in the oven. I use the combo cooker the exact same way you do. All our gadgets should multitask so well!